if you don’t believe me :) When I saw this recipe over at Grin and Bake It, my heart skipped a beat. It was another way to enjoy one of my favorite flavors! MMM! Boy, was it GOOD! It just melts in your mouth! YUM! This would make a fabulous breakfast or a tasty treat! Preheat oven to 350 degrees. Spray a 9×13 glass baking pan with cooking spray. Set aside. In an electric or stand mixer add the flour, salt, sugar, baking powder, milk, eggs, and vanilla. Once combined well , slowly stir in the melted butter. Pour into the prepared 9×13 baking pan. In a large bowl, cream butter, brown sugar, flour and cinnamon together until well combined and creamy. Drop evenly over the batter by the tablespoonfuls and use a knife to marble/swirl through the cake. In a medium bowl, mix the powdered sugar, milk and vanilla together with a whisk. Drizzle evenly over the warm cake. Serve warm or at room temperature. Wow, that looks absolutely delicious! I love cinnamon rolls and this looks like a great new take on that. I made your cinnamon rolls and sent them off to the inlaws as a thank you for babysitting! I hear they went down a treat!I'll have to try out this cake recipe at some point over the weekend I think!Thanks for sharing! Made this cake today and it was AMAZING! thanks spook much for this amazing recipe!!! Wow, that looks sinfully delicious! I am with you girlfriend on the whole cinnamon roll thing! I am making this just as soon as I finish typing! Thanks! Excuse me while I wipe the drool off my keyboard ;) This looks so yummy...I might just have to do some baking tonight! I need to stop reading your blog, I swear I put on 5 lbs just looking at all these fabolous dishes you make. My daughter would love for me to make this for her, maybe I'lls surprise her this weekend? What I really like from this recipe is that does not need yeast, you know, bread or regular cinnamon rolls are more tasting when having yeast, but it takes too long, so when I see this kind of recipe I just jump on it and bake it. I made this yesterday, it was even better than it looks! This is a tastey and easy recipe one I will definately make over and over!!! Well..i made this but also made a big mistake. I melted my butter for the topping, did not have 2 more sticks so i uses it melted which was a runny topping..i thought i'd go with it anyway knowing i would have a different outcome..end result, edible and i'm thinking i will increase the cinnamon when i try this again...So simple, and simple is good! I made these last night.... WOW! very yummy - forget making cinnamon rolls.. i'll just make your cake.. thanks for sharing! Making this, this a.m. Looks great in the oven so far! Can't wait to try it! The topping turned out gooey for some reason. Cake was done when toothpick inserted, so confused why the topping was so gooey. Is it suppose to be that way? Cake had great flavor! I left mine in the oven for 50 minutes!!! Its absoloutly gorgeous and cooked really good but my topping sank to the bottom too!!!! And i did swirl!!!! Id make it again even if tge topping went to the bottom coz it tastes sooo good!!!!! Thanks so much for your post was about to panic when after 35 minutes the middle wasn't near enough done to take out of the oven, so I started to review the comments to see what went wrong. After reading your post I felt so much better. I Will just continue to cook and check in 5-10 min increments. Just made this and it is soooo good and soooo easy!!!! Oh man these are 'sin'namon rolls! LOVE! Made it tonight for dessert- um, it is too good! So much for that "eating healthier" in the new year thing! Found you via Pinterest! i had put my in for 29 min and it was so runny i had to leave it in for another 10 plus minuets. did anyone else have this problem? I made this cake last night and it is T H E - B O M B My son has already requested it for his birthday in April! 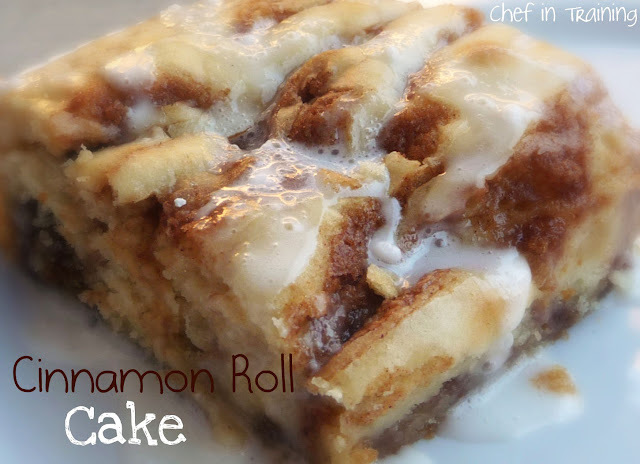 This is such a good idea to turn the cinnamon buns everyone loves into a cake! Sounds absolutely delicious! I made this two days ago and it was AMAZING! The only thing I did differently was, when I saw how thick the batter is, I layered half the batter, dolloped the topping on, then added the other half of the batter on top of that. I think it's easier to get the topping all the way through the thick batter that way, but I haven't tried it the original way. I love cinnamon rolls, in all f their froms. This sounds wonderful. Visiting from your link at TT&J! This looks so delish! Baking this right now. Can't wait to see how this turns out! Oh yum!!!! I'm dying to have a piece of that right now! I make cinnamon rolls from scratch(nondairy version) and love how I can turn it into a cake! I can't wait to make this recipe! I want some NOW! Delish! Thanks for sharing! Seen these on pintetest. Made them. Delicious! Took a bit longer to cook for me but oh so yummy! Thanks! Is this all purpose flour or self rising? Made this last night. It was a hit! I made this cake this morning and it's in the trash! I followed the directions perfectly however, it took about 15 minutes longer to cook and then my family tried it and all deemed it to the trash! I was really looking forward to this recipe and hate that it was wasted. I didnt care for this. Baked it longer (ended up being 37 minutes)... Didnt use all the glaze, and I found it to be way too sweet. I thought the cake part tasted a bit too "doughy" (for lack of better word). Just not a fan. 2 of 3 kids liked it... Was hoping for a show stopping breakfast but we just didnt care for it. Great idea though! I had the same experience. I made it exactly like the directions stated. The topping did not swirl very well at all and the cake itself is very very bland. I ended up with huge chunks of topping in places and none in others even though I swirled and swirled. It split where there was topping in the middle...like a big gaping hole. There is way too much butter in this and I think that is where the chewy comments are coming in. If I made this again, I would probably use a different batter for the cake part. I think I would do as another suggested and put the topping in the middle of half the batter and cover with the rest of the batter. Had to cook if for 5-10 minutes longer than stated and is rock hard on the edges and doughy in the middle. making this cake as i type. it looks gooood. better be. or i'll be angry. you won't want to see me when i'm angry. so let's hope it's goood. tasts like heaven in a pan. Just made this! Huge hit for the whole family and I love that the ingredients are basic! We had everything we needed without having to run to the store. I am going to try individual ones in cupcake for for a birthday brunch! Just got done eating this warm out of the oven, I forgot to add the eggs and it was so good!!! One of my favorite Pinterest recipes so far. Oh my goodness! I JUST made this! It smelled SO good, I couldn't wait for it to cool, so I didn't. ;) Warm, yummy, cinnamony-ness! The cake portion of this is very good! I already have several ideas for it for other cakes. I followed the recipe, but I used a dark, non stick pan with a very small spritz of PAM in the bottom (spread around with paper towel) cooking times were spot on for me. I used unsalted butter for cake, salted sweet cream butter for topping. Didn't measure for icing, just eyeballed some powdered sugar, vanilla and milk. Next time, I might do a cream cheese icing. I WILL be making this again! Thank you so much! I made this in my convection oven and it took nearly 40 minutes to cook. I originally set the timer at 29 minutes but the cake was still like soup. Finally, it cooked at 38 minutes and it was PERFECT, not over done at all! This recipe looks so tasty! We usually have the cinnamon rolls from the refrigerated section on Saturdays as a family. I am going to have to make these instead. I think waiting until Saturday might be to long... yum. My daughter and I made this for Sunday lunch with the family and it was outstanding. We made one change to the cake - we used only one stick (1/2 cup) of butter in the topping. It was ready after about 30 minutes in the oven without the extra butter. We also decided that half of the glaze is plenty. We put it in a ziplock bag, snipped the corner and drizzled it over the cake. We will definitely be making this again. Made this tonight for dessert with friends. It was a hit!!! Everyone loved it. I just got done making it, my husband will be taking it to a pot luck. I hope it is delicious. I'm not 100% sure I like the frosting on top (taste wise) so I might look for something else to use in the future. The cake itself looks amazing. Im a little jealous I wont get any. If you add 1/2 a cup of cream cheese, it will taste much better! Ok, I just made it and it came out pretty nice! I added the 1/2 cup of cream cheese to the glaze, as well as 2 tbls butter, a pinch of salt, and vanilla & cinnamon, and cut back on the powdered sugar by 1/2 cup. Also, if you have a pastry bag, put the filling in that, and squeeze it out in rows onto the cake batter. If no pastry bag, cut the corner out of a plastic bag. Then run the knife thru it. It comes out more even that way. And I added pecans, as someone else mentioned. Quick recipe and my husband will love it!! This cake was so freakin good! I made it and sent pics to family and friends, immediately they wanted to know the recipe. yum-o! Made this today with my five year old daughter. Can I say YUMMMMY!! I did cut the butter down by half on the topping and it still came out great. This recipe looks great! I'll be trying it in a few short minutes. Can't wait! I would like to point out a possible glitch, though....when you go to print the recipe out, the ingredients for the Topping and Glaze are missing. Oh my goodness..... I decided to try this recipe yesterday and it was sooooo good!! I, too melted my butter for the topping... but I just wound up doing some extra swirling. It kinda made my cake soggy in parts.... but delicious nonetheless! Next time I make it... it will be PERFECT! I have just made it! I must say this is soooo delicious! However, this is not a standard cake, when you cut a piece and have it with a cup of tea; this is more of a dessert. As above, I agree that the cooking time should be around 45 min, otherwise it will be still raw. I also think there is too much butter in the recipe, the cake turned out soggy in some parts and when I removed the cake from the tin there was probably good 4 tablespoons of melted butter left in the tin. Otherwise lovely cake. Hi, I know this may sound silly but would you mind telling me what kind of flour you used? Was it all-purpose flour? thanks! Made this and it turned out amazing! Next time I'm going to add raisins and pecans and see how it turns out! How many servings does this cake make? What kind of flour is used to make this cake? All-purpose, self rising?? is it neccesary to do it in a glass baking pan? When I try to PIN this to PINTEREST, it take me to the Cinnamon Roll PANCAKES :( I don't want to pin the pancakes, want to pin this!! Any suggestions as to how I can PIN this particular recipe?! Just asked you where this recipe is. Found it! :) And am already salivating a little at the thought of getting to enjoy in on father's day!!! I read this recipe, Nikki, and everything else in the world just ceased to exist. Seriously: I'm staring at the picture, imagining this in my mouth, and realizing I no longer know math, or how to conjugate the verb "to be". Thank you. I be's forever in your debt. These were loved by my co-workers, but I think I may cut down on the butter in the topping. I placed them on a paper towel, which quickly began to soak up the excess butter.. I would love to make some of your recipes but I can't see the ingredents with that co,or ylu use it'swy to light. Please use brighter, bolder colors. Thank you. Made this last night. Replaced half the butter in the cake part with applesauce and it is still phenomenal! Going to try it with all applesauce next time,try to make it a little healthier! Had planned to make cinnamon rolls today but going to try your recipe instead! Looks wonderful! By the way, this looks wonderful. This will be a hit at our football parties and for the people I work with. Thanks. Love this! This has quickly became our families "thing to bring" to all get togethers. It is so simple and tastes out of this world and is highly reccomended. This recipe is awesome. I have made this twice for my family and they always ask when when I will make it again! I serve it warm with a scoop of vanilla ice cream. I know it's not the healthiest thing to do, but come on! It's dessert! Made this last night and it is divine! It doesn't look quite as lovely as your photo, but it tastes delicious ;) I cut my first piece and ate it from a plate, but I will admit that the rest of my servings have been directly from the pan with a fork as I pass by! The sign of an irresistible recipe, indeed. Kudos! I found this on Pintrest and made it for a church snack. (I use them for my experiments. :) ) All I can say is, AMAZING! I had at least five people ask for the recipe. I made it Saturday night, (40 minutes was perfect) and followed the directions exactly. I left the glaze off then warmed it up Sunday in the church kitchen and put the glaze on right before serving. It was such a huge hit that I'll be making it again and again. Another reviewer said something about the calories...WORTH EVERY ONE! I just made this. I had to bake it quite a bit longer and it looked like a disaster. Not so! Delicious! I made this for breakfast, and modified it to make it more healthy. I only used 1/2 c sugar in the batter - I figured by the time you add the sugar in the topping AND the glaze, it would be sweet enough. Also, I only used half of the topping mixture. I plan on using all of the glaze (my family is very visual, needing to see the sweetness), and we can always add in more cinnamon if necessary on top. Oh, and I also used 2 c whole wheat flour and 1 c white flour. I made this cake today with my Granny and we both loved it. Thank you so much for sharing this recipe! So easy and delicious, a new addition to my "faves." I have made this twice now and it's delicious! So much so that my mother-in-law kept sneaking pieces out of the pan when I wasn't looking. Thanks so much for sharing! OMG! This seriously may be the best thing I've ever put in my mouth! I made it for a church brunch and had so many people ask for the recipe. Truly worth every calorie. Hi, I just made this and something didn't turn out right. It bubbled over the pan, and the center has a solid plain crust swirl in it. I'm not sure what I did wrong. I'm not a big baker so I hope someone give me an idea of what I did. Many Thanks!! it sounds like the pan you used to bake it in was too shallow or too small -- did you use a smaller rectangular pan instead of a 9x13? measure the base of the pan to see what the size is.. the solid plain crust swirl in the center of your cake just sounds like you didn't do enough swirling! next time, swirl the entire cake, including the center! I legit JUST made this and I'm eating it now, warm out of the oven! it's soooo good. I love cinnamon rolls, but I usually don't have the time it takes to make them. however this tastes just like a cinnamon roll and took maybe half an hour (and I'm unorganized!). it looks like a big effort because there are three parts, but each part is SUPER easy and quick to make, especially the last two. I cut this recipe in half though because I don't need a big pan of it! I especially love the buttery cinnamon sugar chucks throughout the cake! That looks fabulous and I'm going to go make it right now!! We have a diner near us that makes cinnamon roll french toast! Slice a cinnamon roll into 3 pieces, dip in egg and milk and cook. It's sooooo yummy! I made this cake last week. Like others mentioned I think the butter in the second stem should be reduced to 3/4 or maybe even half cup butter . Next time I make this that is what I will do . Also think I will add a cream cheese frosting . Its a good cake ! It's in the oven, it looks awesome.. Good way to start the work week after along holiday weekend..
Just a hint to keep in mind: When a recipe has salt and baking power as ingredients you always know to use All-Purpose flour and when those ingredients are not named use Self-Rising because they are in the flour. Second hint: if you only have Self-Rising then just omit salt and baking power and you are good to go. My cake just came out of the oven after 45 minutes and smells great. Making it with my daughter right now! It didn't click in my head that I needed 3 STICKS OF BUTTER so my DH is going to the grocery store for more butter! That's a whole lot of butter! Recipe calls for 4 tsp of baking powder, which sounds like a lot. I only had about 3 tsp in the tin so I hope it was enough. I guess we'll see. I also added a tsp of cinnamon to the cake mix since it only called for it in the topping. Hope it's good! I'll post the results. Not as good as I thought it would be. There ended up being too much dry cake at the bottom. The top was gooey & delicious just too dry underneath. The dry cake would have been great if it was more like cake rather than biscuit. I'm going to tweek it a bit & try again. I just made it - It was fantastic! I cut the butter down in the topping from 2 sticks to 1.5 sticks, and the brown sugar from 1 Cup to 3/4 Cup. I swirled it all the way to the bottom over and over again. Perfect! With my oven, I had to bake it for 40 minutes. The glaze was great, but next time for fun, I'm going to try a cream cheese frosting. This was a fabulous recipe that I will make again! this cake is really delicious and so easy to make... I love cinnamon so this was a real treat. I did cut down on the cinnamon to 1 1/2 tbs. yummmmy? I made this for my family Thanksgiving Saturday. It was a huge hit with everyone. There were 5 desserts for 20 people and I think this had the least amount of leftovers. Two people asked me for the recipe. I have two words regarding this recipe. HELLS YES. I'll be making this tomorrow, thanks! All I can say is WOW! i made this recipe one night... and it was gone by the morning. EVEN BETTER NEW!!! It is amazing as a GLUTEN-FREE dessert as well (my personal favorite now). Simply follow the recipe above except substitute the regular (gluten) flour with All Purpose Rice Flour. It was amazing and was very easy to make. This tastes more like a cinnamon roll doughnut more than anything! Please try this if you or someone you know has a gluten allergy. You will not be disappointed . Thank you for posting about gluten free! I love to convert recipes to gluten free. It is nice to know ahead of time that it works great! In the gluten free remarks about "cup for cup", what does that mean & how do you replace the all purpose flour? This is sooo good. I've made it several times. So easy and always hade the ingredients on hand!! In your instructions for the topping, you say 2 (two) cups of butter. The recipe only shows 1 (one) cup. Which is correct? Noticed the same thing...but it's (1) one cup of butter - the instructions say 2 sticks which equals 1 cup. The entire recipe (cake and topping) requires 1 1/2 cups of butter or 3 sticks. Can't wait to try this out. My problem is that when I print it out, it is so small that I will need a magnifying glass to read it. I kept trying to enlarge the fonts but it wouldn't let me??? It would be nice if it would fill the page. Then easy reading. I had to bake mine for 45 minutes. My icing came out a tan color due to the vanilla. I can overlook that, lol. I'm waiting for it to cool off right now. I AM SITTING HERE AND READING ABOUT THIS CAKE THAT IS MAKING MY MOUTH WATER, I DIDN'T EVEN REALIZE IT TILL I HAD TO WIPE MY MOUTH. and it is soooo low calorie and light.......(snark!). Good tho. What type of flour? All purpose, self rising? How long did you cook the cake for my mom put it in for 50 minutes not sure if it's done but just seems to not cook decent? Made this today...no problems, no issues. came out gooey without being too gooey, and cakey without being dry. Very good, and I will make this again. I just made this today for Sunday brunch with my family! So easy and smells amazing! Can't wait till they all wake up so we can dig in. Thank you for the recipe! I really want to try this recipe but for the topping the ingredient list calls for 1 stick of softened buttet. In the instructions, it says to use 2 sticks of butter. So do I use one stick or two? Sorry, I read the recipe wrong! Lol! I thought it said one stick when it actually says one cup of butter! This is so easy and so good, it will be a recipe I go to often.. I make the same thing only simpler by using a yellow cake mix for the batter & continue on as stated for topping. I add a dash of maple extract to the glaze. Wonderful...everyone asks for recipe. I made this the other night and i have 2 questions.. is the batter suppose to be super thick? and also for the topping it states to use 1 stick of butter but your instructions below when you mix together states 2 sticks of butter.. Which is it? I used only 1 but not sure if correct.. seems like something was missing? Please respond..
i just saw what i did.. it calls for 1 cup of butter and then the below says 2 sticks of butter.. Sorry.. must get my eyes checked..
Just made this cake for brunch for Mother's Day tomorrow! It is delicious, I could eat the whole pan!! I just can't wait to make this!! Cinnamon rolls are my VERY favorite and yours look wonderful!! I can taste them already, warm and drinking a hot cup of coffee!! Thanks for posting this! Made this this morning. I was out of vanilla extract so used almond extract instead. And used oj instead of milk in the glaze. Otherwise followed recipe as is.....delicious!!!! This looks so good. Would you happen to have the nutritional stats? I like to know how much I am eating. Thanks. It was horrible! The center looked like there was too much butter being used. I was careful to follow the recipe and ALL ingredients. Very expensive to make to have it come out this terrible. I will throw it out! Very disappointed. It looked so good in the pictures, but it was horrible and I too ended up throwing it out. To doughy/floury tasting, plus the center never cooked, even after 50 minutes. Not quite sure how to describe it, but I too followed the recipe exactly. This is great! I was able to make it gluten free and dairy free and it was amazing!! I wanted to print your recipe! I couldn't find a print recipe spot! Is there one? Do you do a recipe of the day? If you do, sign me up! I just made this recipe and noticed an error. The topping ingredients call for 1 cube butter but in the instructions it says "In a arge bowl mix the 2 sticks of butter" Should it be 1 or 2 sticks of butter? Yum. Can't wait to make it. This is a great idea but when I saw the amount of butter and sugar, I decided to adjust the recipe and it was wonderful. For the first part, used 1/2 cup of sugar. For the 2nd part, I used 1/2 cup brown sugar and 1/2 cup butter. For the glaze, I used 1 cup powdered sugar, a few drops vanilla and added liquid till the consistency I wanted. This saved calories and money too. And it was delicious. Too much sugar makes be sick to my stomach, but this was just right. We made this last evening and my children loved it! I did end up baking it closer to 50 minutes and it was a little too sweet for me with all of the glaze. Next time, I may only use half the glaze or use a cream cheese frosting instead. Thank you for sharing! Saw these on FB and thought how much my dad and son would love them. Well turns out they did. Wish I would eat them but the smelled wonderfull and was a breeze to make! TY. I was wondering if using Almond milk would make a difference? I rarely buy regular milk anymore and wanted to make this tonight :) Any suggestions? When listed ingredients for Topping I c butter, but in the instructions, it notes 2 sticks of butter. Have you ever frozen this cake? just because I love it. YUM. Is it wrong for me to be thinking about when I can have my next piece already?! Was wondering if there was a way to make this and freeze it - not the frosting but everything else? When I tried to print this recipe I got 8 pages of comments and no recipe, is there a secret how to print this?? I am deff making this tonight! The ingredients for the topping calls for 1 stick of butter, but your instructions state 2 sticks. Which is it 1 or 2? Thanks for a great recipe! Hi! Would like to ask if you use salted butter or unsalted butter. And does it make any difference? Could we make it healthy with W/w flour and chicory root for substitute for sugar? I can't have sugar or white flour. I plan to try this! Thanks! I'm making this as we speak and my house smells SO good!!! can't wait to taste it YUMMY!!!!!!! thanks for sharing this yummy cake. I am wanting to make it gluten free but unsure what flour to use. This was fantastic! Quick and easy to make and I didn't have to pick anything up at the store! The housekeeper awesome and my husband was in awe! Err.....my house smelled awesome, that is! I made this for dessert for after supper this evening...it's the best! For the toppiing, the ingredients list calls for one stick of butter. However, the instructions say combine TWO sticks of butter. I made this cake today. It really was great and easy to make. The cake batter was thick and I thought I cut the second layer into it. However, after the baking process (I gave it 45 minutes after reading all the comments) the cin. layer did not really swirl all through out. Although I am glad it did not drop to the bottom like other comments, I would like to get it to mix in more. Any suggestions? The flavor is great and really easy to make. The end result was very good as far as the cake goes. My family was not a fan of the icing. So I will find a new recipe for next time. I only had to cook the cake about 30 mins (I have a gas stove that cooks fast). The batter was not a cake batter at all for me. It was very runny and the cinnamon mix was very hard to swirl. I melted it a little and then used it. It stayed more at the top instead of sinking. I will do that for next time. I gave it 4 stars. While it was delicious I wouldn't exactly call it super simple. I do like that it is made with stuff that are normally kept around the house, I woke up this morning and decided I wanted to try it. So I made it. This looks like such a delicious cake!!!! The topping ingredients says to use 1 stick butter but on the instructions the toppings is to use 2 sticks of butter.....which is correct? The topping calls for 1 cup of butter (2 sticks). This is a wonderful cake/roll recipe. I made it for my 3 grandsons (all in college) and they had it gone in one setting. The only change I made was I used 2 Tbl. of cinnamon instead of 1. I noticed a discrepancy between butter amounts in list of ingredients for the Cinnamon Roll Cake. The list of ingredients calls for "one stick of butter" for the topping, but then the directions instruct one to put in the "two sticks of butter". If I don't hear from you I guess I'll split the difference and use a stick and a half! cinnamon roll cake. Topping ingredients calls for one stick of melted butter. Instructions for topping says e sticks of melted butter. Anyone know which one it is?????? I made this & it was SO GOOD! Thanks for sharing this recipe! I will be making another within the month. I was wondering if there should be cinnamon in the main ingredients of the batter as well? Looks like it in the picture. You need to check your recipe. In the topping ingredients it list one stick of butter but in the directions it states 2 sticks of butter. Which is correct? Can't wait to try the cinnamon coffee cake. Thank you so much, I have been wanting some cinnamon rolls so bad. This recipe is simple and great, not a lot rolling and cutting. Thanks so much for sharing with us. Also, I could not go any higher than 3 stars should be a 5 !!!!! This is good but in my opinion it is a coffee cake.. I added raisins and toasted pecans to the batter as I do for cinnamon rolls. I only used 1/2 c, butter and 3/4 c. brown sugar in the topping. I halved the glaze as it makes a lot. I will probably make this again at some point. Oh be still my heart, I'm thinking I would mix in a softened 8oz. package of cream cheese to topping to chill the sweet a bit. I love cinnamon rolls, but don't like too sweet. Sound good? OMG! That's all I have to say. My sister always sends me decadent recipes and normally I would only indulge if she is making it because for the most part, our family tries to eat on the healthier side. Nonetheless, I could not resist making this this cake. I followed the recipe as instructed and it tasted better than it looked. Which is saying a lot because the picture alone sold me on making it. When I bake I normally try a piece and then give the rest of it away, our family would not allow me to give any of it away and we ate it until finished over the next 3 days. Definitely going to be my new go to recipe for dessert and it's so easy. Hope you enjoy it as much as we did. Looks so easy. Gonna try tomorrow on a rainy Saturday morning!!!!!!! This sounds delicious!.....but I have a question. In the ingredients you mention 1 stick of butter for the topping, although in the instructions it says 2 sticks. Which is correct? Followed this recipe even after reading some reviews about it swimming in butter. It came out perfect! Had it for breakfast and was perfect with a cup of coffee and sharing it with my handsome husband. Being from Texas, the only thing I will do differently next time I make this is add a LOT of pecans! The cake was good but it definitely was too sweet. Next time I make it, I will cut back on the sugar and butter! I saw this recipe on Pinterest and was so happy because I used to make Cinnamon Roll Cake all the time whenever I had house guest. It was quick, easy, and always a big hit. I have moved a few times since I made it and couldn't locate my recipe. I wanted my boyfriend to try it since he had never eaten it before, so I rushed to the kitchen to make sure I had all the ingredients. I bake a lot, and as a rule don't like to use cake mixes, but right away I could tell this was not my old recipe. I followed your recipe to the letter, and all of my ingredients were fresh. The end result was a total disaster! The cake was so dry it wasn't edible. The only moist part of the cake was the part that had the white glaze and a few of the brown sugar, cinnamon, and butter mixture. Luckily I was able to find my old recipe online which used a white cake mix, and sour cream. The results were wonderful. That Cinnamon Roll Cake was totally consumed and enjoyed. I got tired of the drooling as I kept thinking about this recipe, so I got up at 6:00 a.m. and made a half batch to take to the office. The house smelled wonderful and this was a huge hit. Some of the other baker had comments that there was too much topping. I say, it was perfect! I have weekend house guests next week so this was a trial run, if I can wait that long to have it again! This did not turn out anything like what I had expected or hoped for. Cooking time went right out the window (nearly double the prescribed time), and just plainly nothing like a cinnamon roll. At all. Very disappointing, am hoping someone will eat it before it goes mouldy. A waste of my time, ingredients, and energy. This is outstanding! One look at the picture and I had to make it. Turned out fantastic and it was gone in 3 days! That said, today I made it again except in two separate dishes so we could give one to our parents. Goes great with coffee in the morning! Thanks! I would love to make this cake but I am from the uk so very confused about the cup measurements! I have googled it to search for conversion weights but no website is saying the same!! Can this be made ahead of time and then served? I live alone so don't dare make it for fear I will eat it all up. My neighbors (with whom I usually share treats) are away for the weekend and my son is away at college. I don't think I can wait 'til he gets back. I could make it for my coworkers, but will the cake lose its goodness if I make it tonight and bring it to work for our afternoon meeting tomorrow? This was easy to make and it was wonderful!!! I made this once. It came out great. Very tasty! Unbelievable.....made this 2 nights in a row! Made it for my personal guinea pigs....they absolutely loved it! I've made this several times, it is FANTASTIC!!!! When I saw the recipe I was thinking it was way too much butter (calorie/fat-wise). After reading the comments about it needing to be baked longer and finally one from someone who did use only 1 stick I will do it that way when I make it. I love cinnamon rolls so will enjoy it, for sure. Do you have the Nutritional Information for this recipe? I am diabetic and can't have too much sugar or carbs. Thanks. This looks yummy and easy enough for my granddaughters to make. Thank you for sharing. Awesome! New family holiday favourite! Thanks so much. Cinnamon Roll Cake is absolutely yummy right out of the oven. Is very light and fluffy in texture. Added some cream cheese and vanilla into the frosting on top. Thanks for the recipe as was simple to make and all enjoyed. I tried this Yesterday and the TOP part was great the lower bottom was like tough and I followed directions ,what did I do wrong .My husband said it was like bread pudding . I could not figure it out .. it was like not baked ,but I baked it the time allowed ..
Could not figure out ..
My husband like it .. I made this cake last Sunday as a treat for our small church body. It was a huge hit! My mother asked me to make it for her again and honestly, it was one of the best tasting cakes I have ever made. It tastes like cinnamon rolls but much easier to make! Thank you! After reading the comments, I used only 1 stick of butter for the topping. I really think two would have been too much. Most of the topping did sink to the bottom, but oh, was it delicious!! It was a huge hit. :) Thank you for the recipe! Mine came out very crumbly. Can anyone tell me why? Nikki...This recipe made me a fan of yours for life. I have made it 4 times already and fixing to make it for a friend in Cali. I rated this 5 Stars but the screen only showed 3. I would easily give it 10 stars plus!!! This is a KEEPER for sure! THANKS so much! I was sadly disappointed by this cake. Tasted nothing like a cinnamon roll if you ask me. We just ate this and if three grandsons are the clue to how good it is I give it five stars. It tastes JUST. Like a cinnamon roll. Exactly. Thank you! I have been craving cinnamon rolls, cinnamon pull-a-parts, cinnamon well everything and just don't have the time or energy to make sweet roll bread that often. This totally hit the spot in a lot less time. The first time my sister and I made this recipe, we didn't have enough butter, cutting the amount we used by a good 1/2. It came out perfectly after 45 minutes. We just made this recipe again the proper way using the appropriate amount of butter and needless to say it came out soggy and raw in the middle after 1 hr of baking. I would definitely recommend cutting the amount of butter for the topping in half at least. I agree with you Susan ,even though it was delicious the middle was a little soggy. thank you it looks marvelous. going to try it. love this cake I was skeptical at first . I did add pecans , and it was delicious . Served warm with French Vanilla ice cream. OMG! Wonderful recipe! I put the glaze on right after I got it out of the oven and it didn't show the white. I assume whoever did this recipe and took the photo waited until the cake was almost cool or cool to put the glaze on. I made this for Father's Day, only used one stick of butter for the streusel and added toasted pecans onto the icing. DELICIOUS, thanks. It looks very good, I have never tasted this before. But I like anything that is cinnoman !!!!!!!!! with a name like cinnamon roll cake, I was expecting this to be a little more gooey and decadent. It ended up being light and fluffy like a coffee cake. Still good though and I have a feeling it won't last very long! Cinnamon rolls aren't gooey. That's sticky buns. With caramel. Just took this out of oven and gave three grandsons each a large piece. It's half gone. They absolutely loved it. And so did I. It's decadent and so full of cinnamon. Will make this again and again. made this and it turned out lovely. Very dense but moist. Can you prepare this the night before and bake it in the morning? Whoever came up with this recipe....I LOVE YOU!!! SOO DELICOUS!!! We all love cinnamon rolls, but they take so long to prepare. This recipe looked so easy. I had some difficulty with the topping. I made as directed, but it was too thick to swirl in. I put the topping in the microwave to soften a little more and accidentally melted the butter. It was runny. I thought I ruined it, but decided to bake it anyway and see what happened. I poured the topping all over the top of the batter and swirled it in, then baked it for 35 minutes. It turned out FANTASTIC! This recipe is definitely a keeper. My family thought it was delicious and so moist. Thanks for the recipe. It's now one of my favorites. Can the Cinnamon Roll Cake cut in half? What size pan should be used for a smaller batch. I'm in Denver so always have to worry about high altitude baking...I added an extra Tablespoon of flour and cut out about 3 T of the sugar in the cake mix. Baked beautifully and taste incredible...thanks for the great recipe! The cake part of this did not have much flavor to it and tasted more like bread. Seems good and easy...I think tho I will be adding pecan to the topping. Love love love quick and easy...1 1/2 times the topping for more goodness..make sure you pre heat oven. And double the glaze !!! I love a little more sweetness. Great directions to follow so you can't mess this one up ! This is so good!. Loved it! Thank you so much for giving us this awesomeness! I made this and it was delicious!! Do you think this would be ok to make the day before and then just put in the oven to bake the next morning? I just baked this cinnamon roll cake because I was snowed in & bored. Lol but it came out GREAT & it tastes amazing! ??? To kick this up a little I add cream cheese to the glaze ???? This is such a great recipe. I wanted to make it to bring to work but I didn't dare because of the mixed reviews so I continued searching online for a recipe that has flawless reviews (doesn't exist) but I did find this exact recipe on another site with 1 minor change- for the topping it called for 3/4 cup softened butter instead of a full cup. I followed that recipe exactly except for the icing and I baked it for about 35 to 40 min and it came out perfect. And I mean perfect. I made it again today but I did one thing differently (not on purpose) I did not let the butter for the topping soften enough. BIG mistake. Most of that delicious sugery topping sank straight to the bottom as many have mentioned here. The brown sugar cinnamon topping should be the consistency of fresh mashed potatoes before you drop it onto the batter. Mine today was the consistency of refrigerated, leftover mashed potatoes, so when I tried to swirl I was just moving lumps around, not swiriling anything. For the icing I used 6 TBS butter, 3 oz cream cheese, 1/2 tsp vanilla, 2 TBS milk, 1/4 tsp salt, and about a cup and a half to 2 cups powdered suger. I read a lot of the comments and was kind of scared to try this. But I forged ahead and followed the directions. Mine turned out perfectly and it was yummy! There was no gooey mess, I didn't have to bake so much longer. It tasted great! I can only think of three things that people messed up: didn't use a glass pan, measured the butter incorrectly, melted the butter for the topping instead of using softened...there is a big difference between the two. I also didn't change the glaze ingredients, I don't know how people thought it was too sweet once it's on the cake. It is too sweet right out of the bowl but not when you eat it on the cake. But that's my opinion. Great recipe had no issues with making it. My family enjoy the cake.. I accidentally melted the butter. There was a pool of melted butter over the top of the cake even after swirling the cinnamon mixture. So, I poured off the extra butter. Next time I make it, I might just cut the butter for the cinnamon mixture in half. It will be healthier too. My 1st attempt tasted good but did not look like picture. I didnt have butter for cake batter so i used veg oil. That was fine but then for the topping i used margarine and it was so much, even when i swirled it around all the toping stayed at top of cake. I ended up cooking ut about 10 min longer. Next time i will melt my margarine for the topping so i can swirl it better in the batter. I really enjoy your blog and have made a lot of the recipes you post. I've made this a few times. My kids ( (who have big sweet tooths (teeth?)) were overwhelmed with its sweetness so I cut the topping in half. Now it's more of a coffee cake (amplified when I changed the flour to a mix of regular, cake and ivory wheat) but my whole family loves it. Is a glass pan absolutely necessary? I don't have one and wanted to try this recipe. I've made this twice now. I made a mistake first time around. Got the swirly topping I melted the butter completely and it was still warm. So it poured out across the top of the cake. It swirled in nicely and actually raised in bumpy spots that ended up making the cake look like cinnamon buns. The buttery rich cake flavor was more enhanced with that cake also. I still love this recipe!!! I took it to work and it was eaten up over quickly. It is a delicious cake and a nice change from doing the yeast thing for cinnamon buns. And cinnamon buns seem to dry out so quickly. This did not. Thanks for this deliciously easy recipe!!! I love this recipe! I didn't have any milk so I substituted canned full fat coconut milk and put it in two 9 inch round cake pans, it turned out great. Thanks for the recipe! Had to make this after I saw it on FB. ABSOLUTELY DELICIOUS! clear take out and wrapped with teal ribbon, very impressed they were. You may want to consider adding some crushed walnuts or pecans to the topping. I tried it and it was declicious!!! Followed the recipe to a tee however it took an hour for it to cook. I made this Cinnamon a Roll Cake. When I made the topping, it was very thick. I put teaspoonfull all over the cake mixture. It was so heavy that it would not swirl with a knife or any way. I cooked it but the topping did not blend in. What did I do wrong and how can I make it better next time. Also it was much too sweet with one cup sugar, e cup brown sugar and cups powdered sugar. I love cinnamon rolls but get real about all the butter. Why don't you come up with a recipe with kind of substitute for at least part of the butter OR we all will be Butterballs!!! Can this recipe be used with gluten free flour? I was too excited to make this cake, I didn't read the part about slowly pouring in the butter! I'm so mad at myself! Cake was still raw after 40mins. and the topping is super sweet!!!! Wow! a wonderful cake beats any cinnamon rolls i've ever had!! superb taste and leaves the house smelling heavenly. thank you for sharing this wonderful recipe with us. This morning cake has become my signature coffee cake. It is SOOO GOOD! Everyone I've shared it with has LOVED IT! This is the best ...better than a cinnamon roll. Made this and my wife and daughter absolutely loved it! I definitely took longer than 30 minutes to cook - more like 55, and there was a bit too much of the cinnamon filling, but it tasted great. This recipe is so easy to follow! It taste delicious. I make it at least once a month. Thank you for the recipe! I can't find the baking temp or baking time! I'm assuming 350 degrees? For how long? Can I make this cake the day before? This isreally great! I made muffins for a gift... substituted the cup of sugar in the mix for 4 tablespoons of honey and they were still very sweet...also added some ground cardamom to the flour as a twist. I have made this recipe quite a few times and every time I make it, it is a huge hit! It's so moist and crumbly - and even better when served with a nice hot cup of coffee! Thank you so much for this awesome recipe! Hi I love your cake I have made it 5 times they all turned out great. But I made it last night and the the topping fell to the bottom I am not sure if I over beat it. I will try again. Thanks for a great recipe. I made this recipe for the first time and served it at Teacher/Staff Appreciation Day at our middle school. Everyone was blown away and demanded (!) the recipe the next day! LOL! To say it was a hit would be an understatement. Delicious! Made this for the first time yesterday, for a Fathers Day brunch. It was a huge hit. This recipe is definitely a keeper. Following one of the previous comments I made sure that the butter for the topping was very, very soft. And I swirled in the topping a lot, more than I normally would have. When testing for doneness, be sure to insert the toothpick in the cake part, not in the swirl. That will stay moist. Yum! Was very good! I added some nuts as well! I also made this the day before I needed them for breakfast guest. In the morning I just headed the individual servings in microwave - delicious!